A collectible calendar. 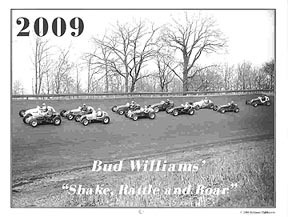 This makes the tenth year for this Bud Williams calendar series! Only the best photos were used for this historical calendar. Featured drivers: Greg Weld, Everett Saylor, Bob Hogle, Frank Luptow, Jim Hurtubise, Ted Horn, Tommy Hinnershitz, Emory Collins, Larry Crockett, Pat O'Connor, Jerry "Scratch" Daniels, Larry Dickson.